This is not only a tin! Our new scented candle range is the ideal way to transform any space: your home, garden, or even a hotel room. 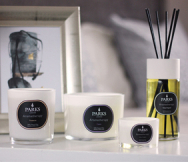 Smell the fragrance and you will immediately recognise that Parks has brought you another superb quality candle.